Despite a 17-2-3 regular-season record against ECAC opponents and the regular season title, the highest that the Quinnipiac men’s ice hockey team can finish in the conference is third place. Brown (15-13-6, 7-9-6) upended the top-seeded Quinnipiac Bobcats (26-6-5, 17-2-3), 4-0, in the ECAC Tournament semifinal game at Boardwalk Hall in Atlantic City, N.J., on Friday. The seventh-seeded Bears scored two goals in the first period and added two insurance scores in the second to knock off No. 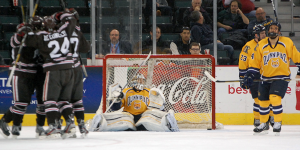 1 Quinnipiac and earn themselves a spot in the ECAC Championship game tomorrow evening against Union. The last No. 7 seed to defeat the No. 1 seed in the ECAC Tournament was Princeton in 1998. The Bobcats didn’t receive the type of performance from Eric Hartzell that has made the goaltender one of the ten finalists for the Hobey Baker Award and earned him ECAC Player of the Year as well as ECAC Goalie of the Year. For the game, Hartzell allowed four goals on 19 shots. His counterpart from Brown, Anthony Borelli, recorded 29 saves to earn the shutout. Brown’s top-line forwards started the scoring at the 9:05 mark when Mark Naclerio took the puck behind the net and slid a pass in front of the net to Matt Lorito, who then put a one-timer past Hartzell and into the bottom right corner. The Bobcats trailed in shots at the time of the goal, 5-4, but used a power-play opportunity, which came just over a minute later, to kick-start their offense. 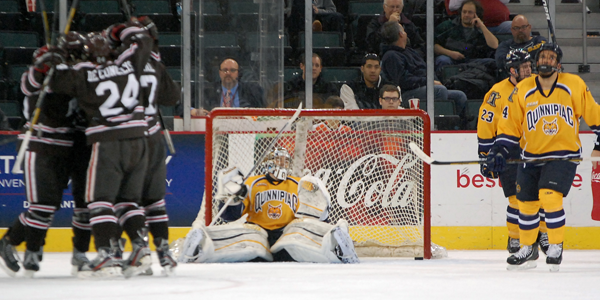 Quinnipiac put four shots on net while on the power play but a dialed-in Anthony Borelli kept the Bobcat’s off the scoreboard. With 3:57 remaining in the first, Garnet Hathaway pushed aside Zach Tolkinen, streaked down the right flank and then snuck a shot under the pads of Eric Hartzell for a 2-0 lead. The second period was more of the same for Quinnipiac as Brown’s well-balanced offense continued to score. The Bears’ third line had an impact in the first period as Hathaway and Ryan combined for a goal. At the 12:56 mark of the second period, the fourth line got in on the action when Joe Prescott sent a pass in front of the net, where it sat unattended to for a moment before Francis Drolet scooped it up and put it by Hartzell for a 3-0 lead. It was Drolet’s first goal since February of 2010, and it momentarily chased Quinnipiac’s Hobey Baker finalist from the game. Just 3:20 later the Bears put the game away with their fourth goal on a 5-on-3 power play. First Connor Jones was called for slashing, then just 46 seconds later Bryce Van Brabant was sent to the box for interference. Lorito made the most out of the two-man advantage and scored his second goal of the game, giving his team a 4-0 lead with less than five minutes to play in the second. Although the winner of the ECAC Tournament secures an automatic bid into the NCAA Tournament, the loss to Brown does not eliminate Quinnipiac from a chance at a national title. The Bobcats are still a lock to make the tournament based on a regular season resume that includes a near three-month run atop the PairWise rankings, as well as a 21-game unbeaten streak. Currie said the team is not looking that far ahead just yet. Tomorrow’s third-place game against rival Yale is important for the team’s momentum and confidence heading into the NCAA Tournament.